As I walked into this hall this morning and saw that women occupied every seat, immediately I understood how women in leadership or aspiring for leadership, feel completely outnumbered. I think that today, we men feel completely outnumbered too. I think l must give notice to men in leadership in Africa that African women are very serious about this business of equal participation in leadership. 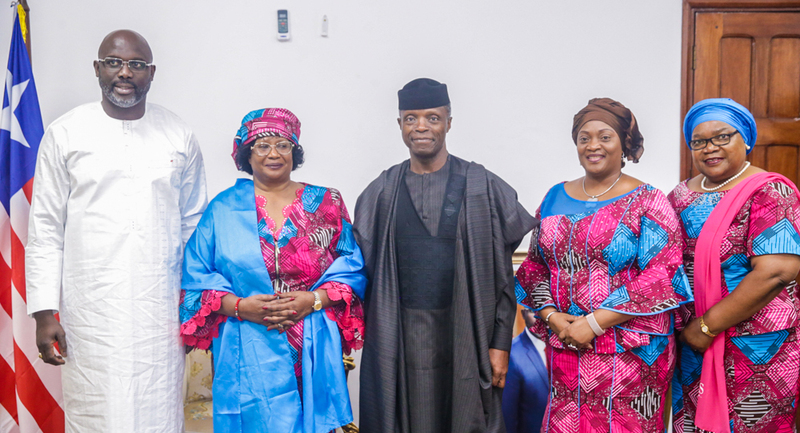 A few weeks ago, a group of women came to visit our President in Abuja and one of their many demands was for the position of Vice President to be allocated to a woman. I had to politely inform them that there was no vacancy in that position at the moment. Let me say how deeply honored l am to have been given this very special award. l accept it with a mixture of pride and humility; pride because of the recognition, but great humility because of the very weight and responsibility that is thrust upon me and upon my co-awardees to be faithful to the cause that is given, which is that of ensuring women are given not just their rightful place, but an equal place at the table. Let me say again, how deeply honoured l am to have been invited to be a part of the first Sheroes Forum to hold here in Liberia. And it is appropriate that it should be celebrated here in Liberia; this is the nation that has the distinction of producing Africa’s first elected female President, Her Excellency, Ellen Johnson Sirleaf. And I might add for good measure that she is also the first African woman to be elected twice as President of her country, even as we await the second coming of Her Excellency, Joyce Banda. She is also and l mean Madam Ellen Johnson, the first female Chairperson of ECOWAS and of course Liberia must also take pride in the fact that our host, my dear sister, Her Excellency, Jewel Howard Taylor, is only one of four female Vice Presidents in Africa. Let me also bring you the warm personal greetings of Nigeria’s President, Muhammadu Buhari, to this historic gathering. 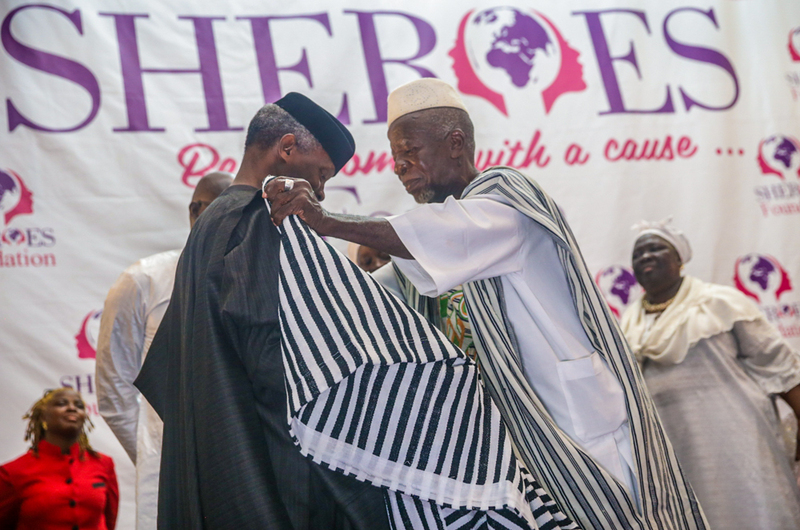 Incidentally, he also enjoys the distinction of having the honour of Champion of the #HeforShe Campaign in Nigeria conferred on him. Indeed, as a father of seven confident daughters, he really does believe that he, more than anyone, should be a passionate advocate of gender equality. 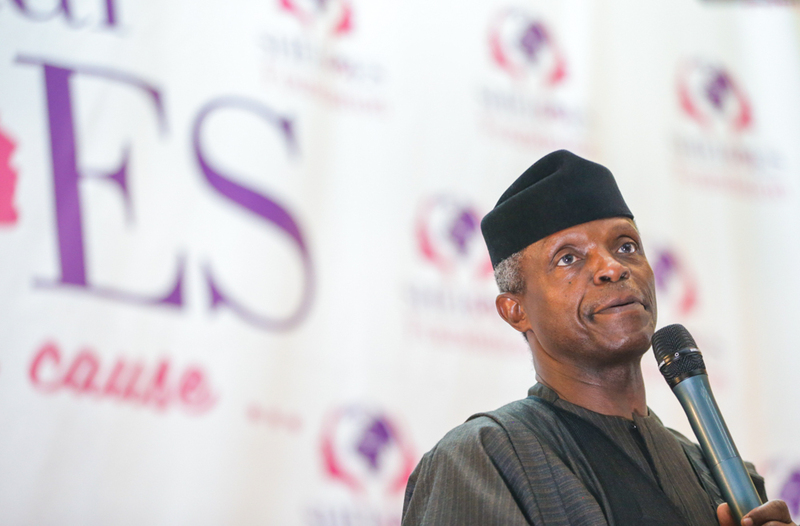 And so should l, I also have two daughters, Damilola and Konyinsola; they are both out of university. They have been entrepreneurs even from their days in school. But more importantly, from the days they were born, they could assume that they would have equal legal, social and political status and rights as their only brother and as any other male. This is so because they were born to educated and perhaps, modestly economically successful parents. I am sure that is the case, for many of us here in this room that have daughters. Our daughters are educated or being educated and can and will compete favourably with their male counterparts anywhere. They will aspire and can attain political leadership. This is by virtue of the privileges of the circumstances of their birth; they are positioned to break the glass ceilings in commerce, the professions and politics. But the story of the daughters of those of us in this room is not the story of the large number of girls in our countries all over Africa. Over 40 per cent of girls in Africa on the average, are illiterate; illiteracy means that they will not find decent, well-paying jobs. They will in many cases, would be married off early, and have children while they themselves are still children. Many would be discriminated against in inheritance rights, or punitive widowhood practices; they would work the hardest on the farms, and long hours in the markets but would earn far less than men. These historical deficits ensure that women will be underrepresented in leadership at all levels. But even the educated will probably, several times in their working lives, be subjected to one form of gender-based discrimination or another, many may even add to the growing statistic of victims of domestic violence. For many generations, women have fought these manifestations of gender inequality. Over time, the struggle has been refined to the level of a right to gender equality; the notion that women and men should have the same legal, social and political rights. This body of rights is the public law basis for what we now describe as Feminism. Feminism initially attracted suspicion and hostility especially from men; a feminist was seen as an aggressive, man-hating, over liberal woman. But something has changed in the past few years. Women are now saying that the fight for gender equality is not one for women and girls alone, it is also a fight for all fair-minded and just men who believe that men and women must have equal rights. But the campaign is much more important in shaping the future. Men are now being challenged to stand shoulder to shoulder with women in the struggle for gender equality. They are learning that insisting on equal rights for women is not a favour being done to women, it is an imperative of justice and fairness, an entitlement, a debt owed to women and girls, not a gift. This is perhaps in my views, one of the greatest leaps of development in contemporary history. When boys and girls today don’t take gender equality for granted, when women and girls are free to reach their full potentials, to get education and earn equal pay for equal work, to aspire and attain the highest political positions not once in a while, but all the time, then the full potential of the other half of the population of the world will be unleashed. The implications of such a development, for a vastly improved quality of life for all of us, can only be imagined. 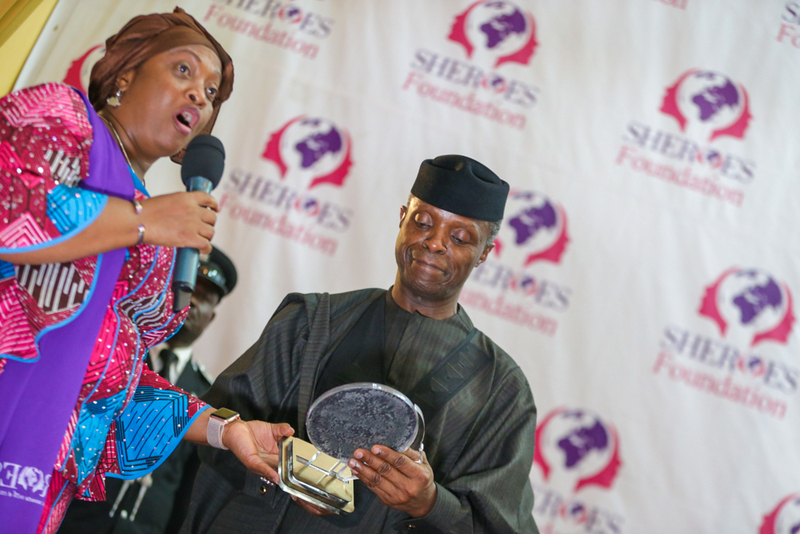 It is this ideal that has informed the great work that the Sheroes Foundation has been doing and for which they deserve our commendations. 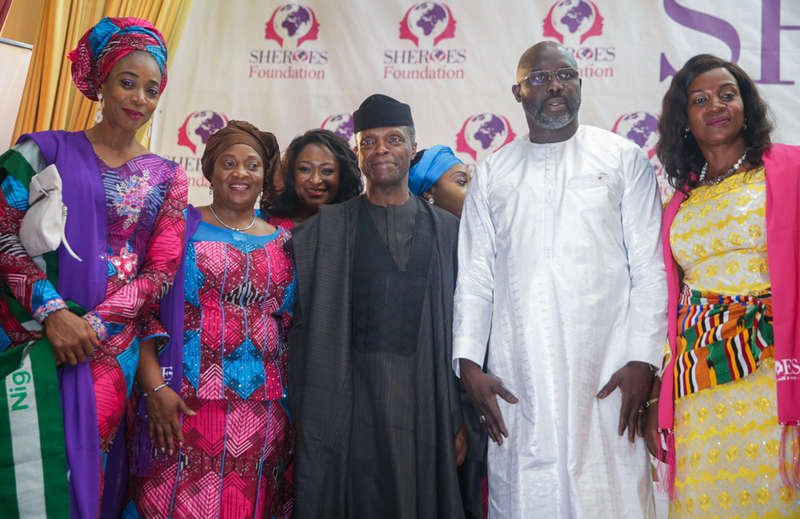 I really commend the co-founders of Sheroes Foundation for the excellent work they have done so far. Let me say that we all, especially African men, are coming to the realization that gender equality is in our collective interest. It just makes sense for everyone regardless of gender, to contribute his or her bit to the social and economic good of our continent and our world. And secondly, we cannot truthfully speak of our respect for the dignity of the human person without a commitment to the rights of women and girls. The concrete expression of that commitment is the full and equal participation of women in the commanding heights of commerce, the professions and government. I want to thank you again and thank the organisers for the privilege and honour of inviting me to this place. 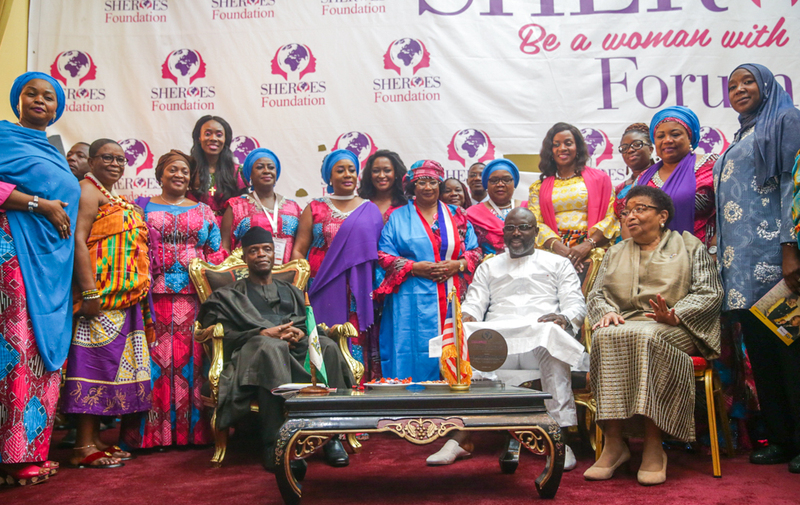 God bless and prosper the great work of the Sheroes Forum.